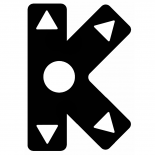 2015 has been an amazing year for me, gaming-wise. As someone with a day job, a family, and now even a child, I haven’t got all that much time for gaming, but I’ve had the chance to play through several remarkable games this year, as you can see by some of the reviews I’ve done so far. In the last three months, I got the chance to play Tactics Ogre: Let Us Cling Together – a remake of a 1995 game that had apparently done things contemporary games cannot even dream of, despite some of them claiming them. What I’m talking about is, of course, your choices throughout the game actually mattering and changing the story completely, as opposed to the illusion of choice games like Mass Effect and The Walking Dead offer, where you only get the ability to affect details, but not the main storyline. Tactics Ogre is a strategy RPG, and the only one I’d played and beaten in this rather niche genre so far had been Final Fantasy Tactics. That is a massive game to try to live up to, as Tactics is among my Top 5 games of all time. And Tactics Ogre did not manage quite the same impact, but I must say that it also beat Tactics in some aspects – the branching story with “shades of grey” morality first and foremost, but also the fact that the plot keeps the supernatural elements to a (perhaps necessary) minimum, unlike Tactics which I felt went a bit overboard with the Lucavi and everything related to them. It is a very realistic depiction of medieval warfare and power struggles, and that is a big reason to love it. All screenshot in the review have been taken by me. In case you have played the game already, feel free to also check out the playthrough thread on the Between Life and Games forum. 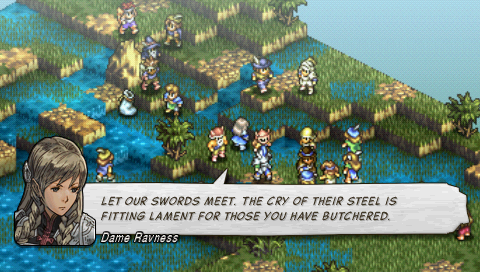 Tactics Ogre depicts the chaos of war, the often unnecessary cruelties, the terror, the bloodlust. The brave heroes believe they are fighting for what is right… But often what they see as right means destruction for plenty of innocents who happen to be on the wrong side at the particular moment… This is Tactics Ogre’s biggest message – in war, there is no black or white, there are only shades of grey. 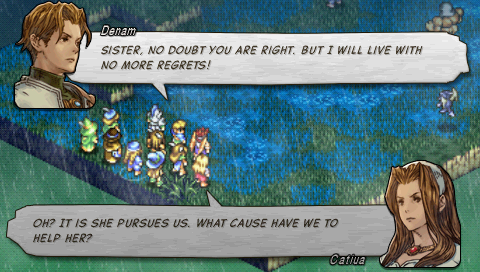 The game offers you multiple paths that change the rest of it entirely – you can choose loyalty to your superiors, or you can choose to pursue your own goals and follow your own ideals… But no matter what you choose, Denam’s military advance will cause harm to some innocent people. That is simply how war works. The complex political situation in Valeria and the many powers at play, each of them pursuing different ends, make casualties inevitable. 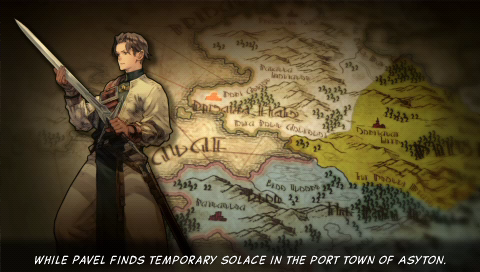 Another thing I love about this game’s narrative is the fact that the tired old story of “young, inexperienced hero gains power along the way and eventually saves his land” looks actually achievable in this specific context. 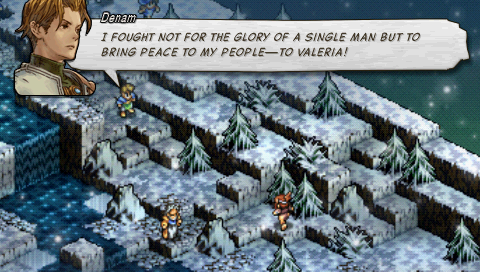 Denam doesn’t just destroy everything in his path like a stereotypical protagonist. The circumstances simply work in his favour. In the very beginning, he comes across a group of mercenaries from a foreign land called Xenobia, who decide to help him with his initial goal because they see the opportunity to earn some money that way… And from there, he has the opportunity to slowly grow his own small army, encountering other powerful would-be allies along the way. As you play, you feel your own understanding of the big picture in Valeria grow with every next battle. You feel that, in Denam’s shoes, little by little, you can really obtain substantial power and lead your people to freedom. 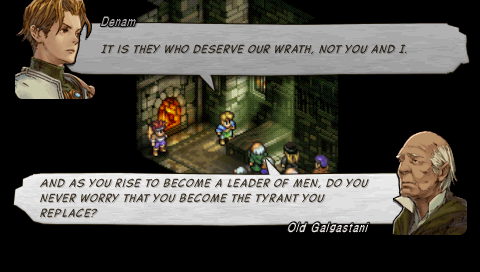 There are plenty of important characters in Tactics Ogre, and while few of them are developed significantly (but they usually have backstories at least), the cast is pretty strong as a whole, and quite adequate considering the political story. One cannot help liking Denam, although his personality is really determined by the choices you make along the way – especially the important, story path-branching choices. His portrait and general attitude is pretty cool, though. He’s young, but has seen lots of suffering due to the war, and knows that only by taking the sword now can he eventually achieve peace for his people. He’s not on the level of the amazing Final Fantasy Tactics protagonist, Ramza, but he has an important advantage over him – choice. His portrait is pretty cool-looking, as well. His sister Catiua is quite attached to him, seeing as he’s her only living relative – during a sacking of Golyat before the events of the game, their father was captured by the Dark Knights of Lodis (allies helping the Bakram regime) and is presumed dead. She has a strong preference for safety over recklessness, and sometimes comes at odds with Denam who knows that a war cannot be won without taking some risks. Vyce is a rather rash fellow, and maybe a bit jealous of the sibling attachment between Denam and Catiua, as he has no surviving relatives at all. 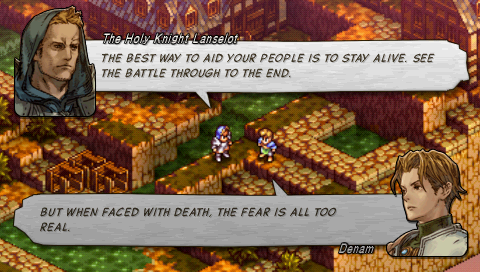 The Xenobians Denam encounters in the very beginning are actually among my favourite characters, especially the Holy Knight Lanselot, who is apparently the protagonist of an earlier Tactics Ogre title I haven’t played. Here, he is somewhat of a mentor for Denam, but also his friend. And one cannot helped liking the Vartan (winged human) Canopus, who is not only cool as a character, but also a very powerful unit in battle, as height differences on the map do not affect his movement (wings are very useful!). 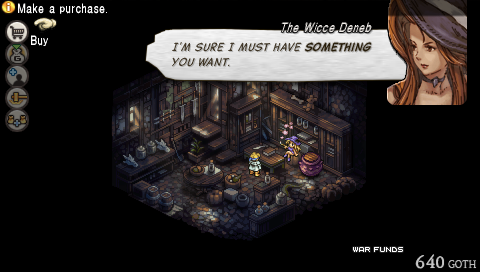 There are lots of characters that can be either friends or enemies with Denam, depending on the path he chooses… This is another wonderful feature of the game. In one playthrough, you could have somebody in your own party, in another, you could be fighting them to the death. You get the chance to recruit plenty of characters along the way – sometimes it’s as easy as helping them in battle, other times, you need to fulfill other requirements. The archer Arycelle and the warriors Cistina and Cerya, as well as the healer Abuna Donnalto, are the most memorable. I found Dame Ravness to be the prettiest girl in Tactics Ogre, but sadly I did not get to interact with her much on the story path I chose. And the most notable “villains” – if that word can be used at all, seeing as the game emphasises on how there are no “good” and “bad” sides in war, are Regent Brantyn, who cunningly managed to take power into his hands after the death of the king, and Lanselot Tartaros, the one-eyed, charismatic leader of the Dark Knights. 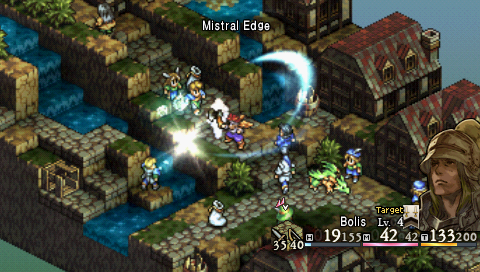 If you have played Final Fantasy Tactics, you will be very familiar with Tactics Ogre’s gameplay. Battles take place on a map with varying terrain, height differences being extremely important because obviously you cannot attack somebody much higher than you with a sword, and often even with a bow or magic… Annoyingly, you will usually have a height disadvantage in battles, but I suppose it makes sense story-wise, as you happen to storm fortresses and such occasionally. Sometimes, the terrain is mountainous regions can even contain gaps leading directly into the abyss – be careful not to let your units get knock down there. Anyway, before a battle, you prepare a number of units – there’s a limit to how many you can use, from 1 to 12. The enemies will be about as many as your own units, usually a few more, to balance out the fact that they are, after all, controlled by AI. As the battles go on, you move your units around the map and use various attacks and abilities, until you eventually strike down the enemy’s leader – the usual goal in story battles. In random battles and a handful of story ones, however, you will have to bring down every last enemy to win. If a unit of yours is struck down, you have 3 turns to revive them, otherwise they lose “a life” – unlike in the original, here units have three lives/hearts before disappearing forever. It’s a good self-imposed challenge (one that I of course did) to beat the game with all your units alive, and without taking advantage of this hearts mechanic at all. Beware, though, Blessing Stones – the item used to revive allies, are very expensive. So is the resurrection spell, at a whooping 100 MP. 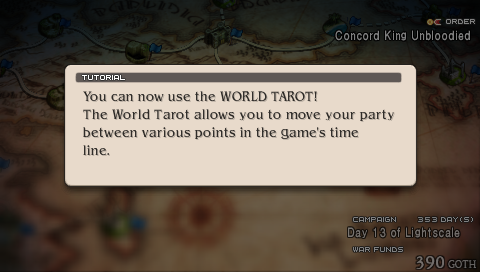 There are plenty of classes you can use in Tactics Ogre – warriors who are “jack of all trades, master of none,” archers, knights, ninjas, swordmasters (equivalent to samurais in FFT), clerics (healers), wizards (black mages), etc. The interesting twist here is that you level up classes, not units – having one archer at the end of the battle will earn experience for the archer class as a whole, so any other archers who did not participate in the battle benefit, as well. You can change classes at will – well, if you have a particular item that allows you to change to a certain class, but those are easy to come by for the more ordinary classes, and hard-to-impossible for more special classes like white knight, warlock or fusilier (gun user). One of the most important things and a main damage dealer are the Finishing Moves – they depend on the weapon type, and more are unlocked as you use a certain weapon type a lot. The only “experience” individual units earn after a battle are the so-called “skill points,” which allow you to learn new abilities for that unit. Most abilities are common for all classes – ones like Parry, Fortify (increases defence), Strengthen, Dodge, etc. But there are also special abilities per class, some of which are really useful. For example, the ninja’s Double Attack allows ninja units to strike twice per turn. Unlike in Tactics, where this ability makes ninjas pretty powerful, here it’s a bit culled by the ninja weapons not being as powerful as swordmasters’, for example, so 2 attacks by a ninja still do more damage than a swordmaster’s attack, but say ~120-130%, not 200%. You cannot use a special ability of a class when you change the unit to another class. I am quite partial to using black magic in all RPGs, and wizards here can learn magic based on elements – you have “Fire Magic” as a separate ability, “Earth Magic”, “Light Magic”, “Dark Magic”, etc. But since they are cheap at 50 skill points each, this still allows you to have “complementary” spells from other elements in addition to your main spell tree. Spells themselves are learned by using spell scrolls, which are won in battle or purchased from shops. 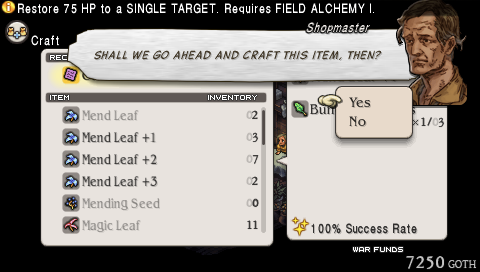 Speaking of shops, there is also the wonderful “Crafting” menu, which allows you to make your weapons, armour and even healing items more powerful by using raw materials. Shops are also where you can hire new units, if you need them. Of course, you will only find units of basic ability there. But I did come across a pleasant surprise that way – my late grandmother’s very Bulgarian name Nikolina popped up in the random name generator for female units. I think I came across another one or two Bulgarian names as I played. And most importantly, once again, the best feature of the game… Your choices really matter and send the story on a completely different path, influencing everything afterwards, as well as the ending. In an era where the illusion of choice is prevalent, where games loudly advertised as full of important choices simply let you pick the colour in which a predetermined ending is rendered, this was a breath of fresh air. Furthermore, choices of secondary importance are also abundant. Usually, they determine things like whether a certain character joins you or not. After you beat the game, there is even an ability surpassing “New Game +” – you are put in control of your party right before the ending takes place, and can do side quests (including new ones that unlock only after you beat the game) at will… Or even time travel to an important branching point in the past and change the story’s outcome entirely! This is a real treat for the player. 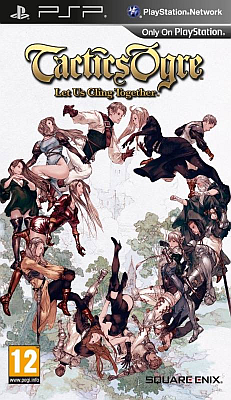 Tactics Ogre: Let Us Cling Together naturally looks much better than the original 16-bit version… Everything has been redrawn, character portraits, terrain, maps being much clearer than before. 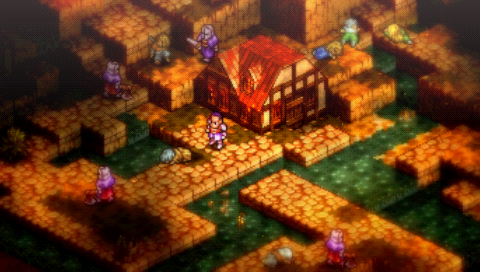 The style is kind of similar to Final Fantasy Tactics, but not completely. For instance, characters tend to have visible noses. The different classes look cool, though there isn’t that much variety as can be seen in Tactics. 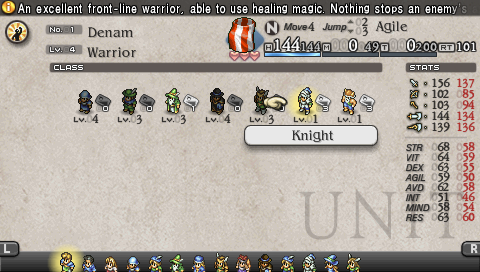 Then again, in Tactics we have crazy classes like Time Mages, Geomancers and Calculators, which are not found here. One thing I really enjoy about this kind of games is that all cutscenes take place on what could very well be battle maps, too. Battles can take place anywhere – towns, forests, beaches, castle walls, throne rooms… There are even maps with volcanic terrain. 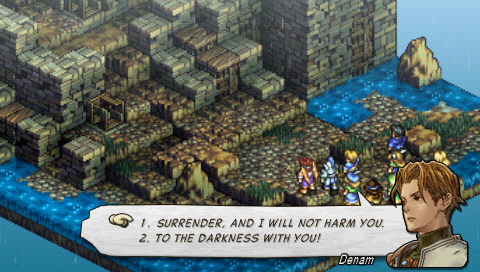 The soundtrack of Tactics Ogre is pretty cool, though maybe a tad below the quality of Final Fantasy Tactics. The same people have worked on both of them – Hitoshi Sakimoto and Masaharu Iwata, so the style will be familiar. 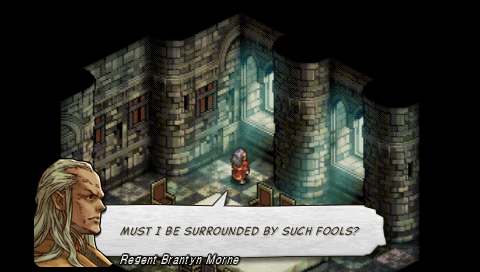 Much like in FFT, some themes are very memorable. They certainly had me pumped up while fighting. It was very hard to choose a song to represent the entire soundtrack here. Eventually, I picked “Avilla Hanya”, one of several really good and inspiring battle themes. 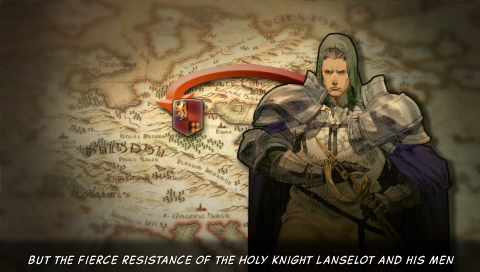 Tactics Ogre: Let Us Cling Together demonstrates how a remake should be done. The main story and everything important is kept completely intact. The visuals and sound are upgraded. There are of course extra features, but they only barely affect the story. One can hope that the upcoming Final Fantasy VII remake is done this way, but one cannot have any faith in Square Enix when it comes to big releases… I digress. 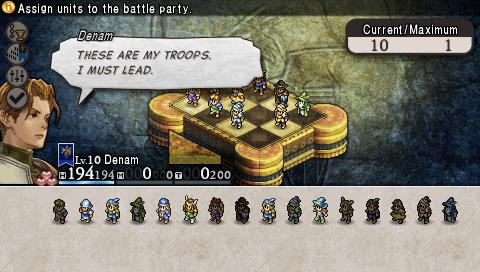 Tactics Ogre is a marvel even today with the importance of the choices you get to make. You will not find dialogue wheels and 5-6 responses to choose from – usually there are just 2 options, but they actually change the path Denam and his allies walk down. This is priceless. If you have played and liked Final Fantasy Tactics, if you are in any way familiar with tactical RPGs, I cannot recommend this game enough. And even if you have never played a game of this genre before, this is a pretty good place to start. It gets its main message about there being no pure “good” or “evil” in war across quite elegantly. It’s a fun game that requires lots of thinking as battles go on. The challenge is good as long as you don’t overlevel, so keep the random battles to a minimum. It is entirely up to you how Denam’s destiny will unfold.